Today on Office Chair Envy we're highlighting the best selling office chairs from one of our favorite brands, Eurotech Seating. 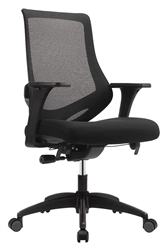 The chairs crafted by this industry leading manufacturer offer the cutting edge design characteristics and ergonomic features needed to help users reach peak performance levels in the workplace. Enjoy! First up, the chair that put Eurotech on the map! 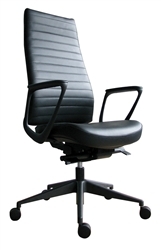 The LEM4ERG model Ergohuman high back executive chair with black leather upholstery is the perfect option for any shopper looking for the best and not willing to settle for less. The Ergohuman packs a major ergo punch. With too many adjustment features to list, this is one chair you'll need to sit in to fully appreciate. Your office visitors will be envious from the moment they step into your space once they feast their eyes on the FUZ9LX-HI model Fuzion Luxury office chair from Eurotech Seating. 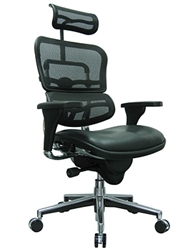 With it's cool chrome accents, breathable mesh back design, and multi functional mechanism, the Fuzion chair makes achieving top notch support and unrivaled appeal a breeze. Give your boardroom a major boost with the Frasso ribbed back office chair from Eurotech Seating. This luxurious black leather boardroom chair falls squarely inline with the hottest seating trends of 2016. The sleek European design will help your business maximize the number of guests that can be seated comfortably around your boardroom table. Your office visitors will think you broke the bank to give them a case of office chair envy when they see the Astra chair. 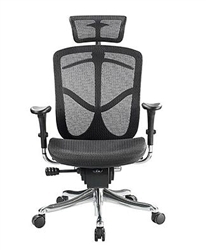 With it's high end features and contemporary curves, the Astra mesh back swivel chair looks for more expensive than it's minimal $203.50 price tag indicates. The upper back design of the Astra chair avoids restricting upper body movement while the multi functional mechanism and adjustable arms help users get posture perfect without the headaches commonly associated with mastering a new office chair. We've saved the best for last! While not practical for everyday tasking and computing use, the Nuvem chair is an absolutely awesome seating solution that was a must for today's post. We're envious every time we see somebody purchase one! With an adjustable tablet arm, leather seating surfaces, and matching ottoman, the Nuvem has it all. Available in two cool color combinations, this top of the line modern recliner is perfect for upscale executive interiors. It just doesn't get better than the Nuvem. 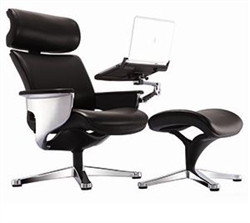 It makes the perfect fantasy football command center, personal workstation, and home lounger.